The text below is an excerpt from Michel Chossudovsky’s Towards a World War Three Scenario, The Dangers of Nuclear War. first published in 2011. At no point since the first atomic bomb was dropped on Hiroshima on August 6th, 1945, has humanity been closer to the unthinkable – a nuclear holocaust which could potentially spread in terms of radioactive fallout over a large part of the Middle East. All the safeguards of the Cold War era, which categorized the nuclear bomb as “a weapon of last resort”, have been scrapped. “Offensive” military actions using nuclear warheads are now described as acts of “self-defense”. During the Cold War, the doctrine of Mutually Assured Destruction (MAD) prevailed, namely that the use of nuclear weapons against the Soviet Union would result in “the destruction of both the attacker and the defender”. In the post Cold war era, US nuclear doctrine was redefined. 2) their explosive yield (measured in mass of trinitrotoluene (TNT), in kilotons or megatons. The tactical nuclear weapon or low yield mini-nuke is described as a small nuclear bomb, delivered in the same way as the earth penetrating bunker buster bombs. Tactical nuclear weapons, in terms of in-theater delivery systems are comparable to the bombs dropped on Hiroshima and Nagasaki in August 1945. 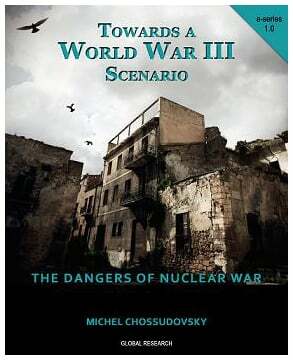 Towards a World War Three Scenario, The Dangers of Nuclear War.